Smart textiles are gaining popularity at a rapid pace and the major drivers identified for this growth are increasing demand for smartwatches and wristbands, increasing demand for sophisticated gadgets with advanced functions, miniaturization of electronic components, and rapid growth of low-cost smart wireless sensor networks. The overall market for smart textiles is expected to reach USD 4.72 Billion by 2020, at a CAGR of 33.6% between 2015 and 2020. Major players in the smart textile ecosystem were identified across the regions and their offerings, distribution channel, and regional presence is understood through in-depth discussions. To find out the overall market size, number of shipments and average selling price were used. Also, top-down and bottom-up approaches were used to estimate the sizes of other individual markets by using percentage splits from secondary and primary research. The entire procedure includes the study of the annual and financial reports of the top players and extensive interviews of industry leaders such as CEOs, VPs, directors, and marketing executives for key insights. The figure below shows the breakdown of primaries on the basis of company type, designation, and region conducted during the research study. To know about assumptions, download the pdf brochure. This report takes a close look at the smart textiles market, providing a holistic outlook on market dynamics, industry trends, and supply & demand. The study aims at providing granular information regarding estimates and forecasts for the smart textile market segments. This report is based on an extensive research study of the smart textile market and aims at identifying the entire market and all its sub-segments through extensively detailed classifications. The demand for smart textiles is expected to grow significantly and gain importance across various domains. APAC is expected to be the fastest-growing market during the forecast period. The report also discusses the future of the global market with roadmaps, upcoming technologies, and applications with respect to the smart textile market. Some of the key players in this industry include Google Inc. (U.S.), Intelligent Clothing Ltd. (U.K.), International Fashion Machines, Inc. (U.S.), Interactive Wear AG (Germany), Schoeller Textiles AG (Switzerland), Textronics, Inc. (U.S.), Vista Medical Ltd. (Canada), Textronics, Inc. (U.S.), Gentherm Incorporated (U.S.), and Sensoria Inc. (U.S.). The overall market for smart textiles is expected to reach USD 4.72 Billion by 2020, at a CAGR of 33.6% between 2015 and 2020. 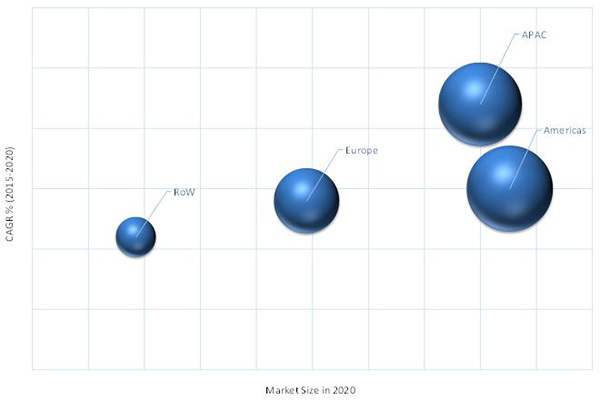 This market is primarily driven by the uptrend in wearable electronics industry, increasing demand for sophisticated gadgets, miniaturization of electronic components, and a rapid growth of low-cost smart wireless sensor networks. The smart textiles market for the military and defense application was the largest in 2014. Textile-based materials equipped with nanotechnology and electronics have a key role in the development of technologically advanced military uniforms and materials. Active and intelligent textiles, integrated with electronics, have the capacity of improving soldiers’ performance by sensing, adapting themselves to the preset state, and responding to a situational need allowing the fighting soldiers to continue their mission. Smart technologies aim to help armed forces perform everything they need to do with a less number of devices and load. Smart textiles provide uniforms with a single, central power source. This allows soldiers to carry one battery instead of many and cut the number of cables required for their kit. The smart textiles market based on different functions is segmented into sensing, energy harvesting, luminescence & aesthetics, thermo-electricity, and others. Out of all these functions, sensing is the largest segment for which smart textiles are used. Textile sensors form huge and significant sub-segment of smart textiles. This is because the sensing ability is the most essential characteristic of any smart textile product. Smart textiles have applications in medical, sports, personal protective equipment, geo-protection, military, and aerospace sectors, where sensing and monitoring are already used and would only be made more efficient if integrated with textiles. Thus, sensing functions have grown rapidly in the smart textile market and the same trend is expected to continue during the forecast period. In 2014, the Americas accounted for the largest share of the smart textiles market due to several factors. One of the most important factors is technological innovations and advancements, which led to the introduction of new products. The increasing demand from consumer electronics and medical sectors has led to the growth of the smart textiles market in the Americas. Other factors promoting the growth of the market are increasing incidences of chronic diseases, diabetes patients, ease of use, and easy interpretation of medical devices. Some of the key players in this industry include Google Inc. (U.S.), Intelligent Clothing Ltd. (U.K.), International Fashion Machines, Inc. (U.S.), Interactive Wear AG (Germany), Schoeller Textiles AG (Switzerland), Textronics, Inc. (U.S.), Vista Medical Ltd. (Canada), Textronics, Inc. (U.S.), Gentherm Incorporated (U.S.), and Sensoria Inc. (U.S.). High cost and the lack of exhaustive standards and regulations are the major restraining factors for the growth of the smart textiles market. High initial price may restrain the addressable market to only high-end consumer space in certain application areas. However, the factor would not have a long-term negative impact on consumers due to the increasing popularity of smart wearables. The lack of exhaustive standards and regulations is making it difficult for smart textiles manufacturers to scale up and commercialize new and incremental technologies. However, research activities and immense interest from stakeholders would eventually address this issue. 12.2 AIQ Smart Clothing Inc. Figure 32 Threat of Substitutes in the Market.